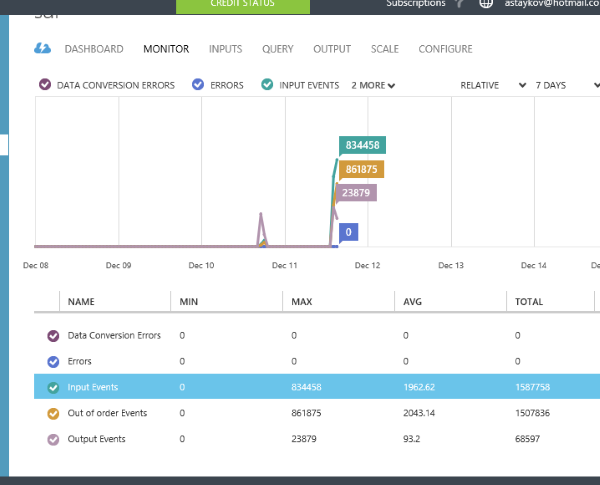 Just little over a month ago Microsoft announced public preview of a new service – Stream Analytics. A service designed to process in (near) real time huge amount of streamed data. With its current state the services integrates with Azure Event Hubs and Azure Blob storage for data source streams (also called Inputs) and Event Hubs, Blob Storage, Azure SQL Database as possible write targets (also called Outputs). With the support of SQL-like language, you can design your stream processor so you can slice and dice your real-time input data, and turn it into a trustful information. Scaled my event hub to 10 scale units. Thus achieving potentially 10000 events per seconds target. Changed the Event Hub sample code a bit to bump up more messages. Code changes to the original Service Bus Event Hub demo code. Thus I start the processes almost the same time. And wait to finish, i.e. to have all processes send all their messages. Twenty times 50 000 messages should make 1 000 000 messages. Then just get the result of the slowest operation. Of course all the measures are then a little approximate, but good enough to give me idea about the possibilities in my hands. Without the need to invest in expensive hardware and developing complex solutions. One more thing – I started my stream analytics job before I start my data pumping command line executable, just to make sure that the Stream processor is already there when I start bombing with data. Please note couple of things. First of all Stream Analytics is in preview, so there might be issues and glitches. But the end results are just astonishing. Looking at the graphs for both the Event Hub and Stream analytics is just awesome. By the way, the last thing that I proved, is that new service tiers of Azure SQL Database are also awesome. With this amount of data in stream analytics, it had no issues writing the results into a single Basic (with 5 DTUs) database! I began seeing the results in my SQL Database table at the moment I switched from started command line programs to my SQL Server management studio and could see the result coming in real time. 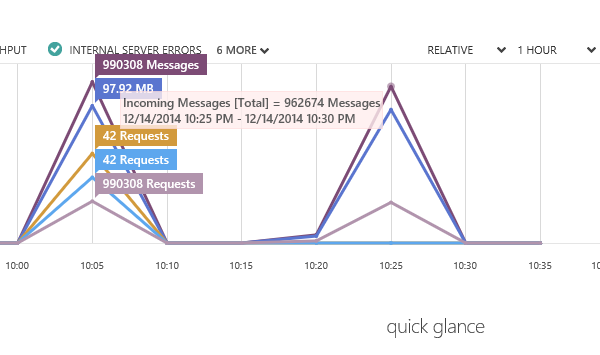 Azure Event hubs, millions of messages. How long would it take us if we had to create a local test lab to process that amount of data? With this base line, I am convinced that Azure Event Hubs can really deliver millions of events per second throughput, and that Stream Analytics can really process that amount of data. You (as developer) don’t want to be responsible for the leak of tens or hundreds of thousands passwords and personal data. This responsibility is just too high. 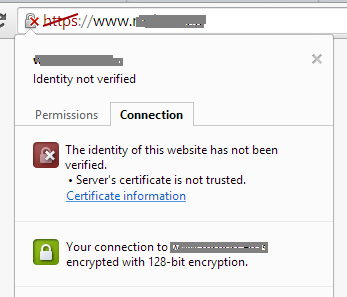 Having said that, I have also written a number of articles on claims based authentication, custom login pages, etc. In all of them user had to go through some learning curve. This is not the case today! Today, Microsoft is thinking about developers and lets them to focus on application itself, business logic and just does not care about authentication! 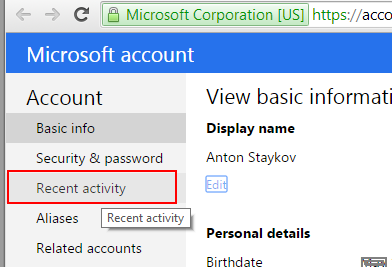 Do not forget that you can run .NET (ASP.NET WebForms, MVC and even ASP.NET vNext! ), Java, Node.Js, PHP, Python on Azure Web Sites today! 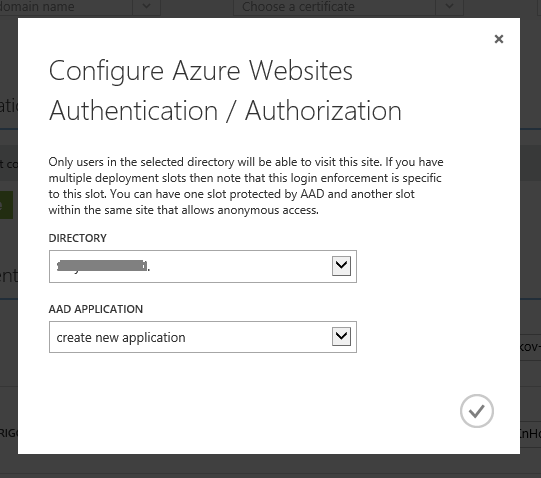 With three easy steps, you can protect your Web Site with Azure Active Directory! What is Azure Active Directory – this is the Identity management system that is responsible for all Office 365 subscribers, Dynamics CRM Online subscribers, Microsoft Intune and all Azure Subscriptions! You may even had no idea, but with every Azure subscription, comes one default Azure Active Directory. So, if you are using Azure, regardless of that being MSDN benefit, Regular pay-as-you-go or a free Trial, you already have one Azure Active Directory tenant! 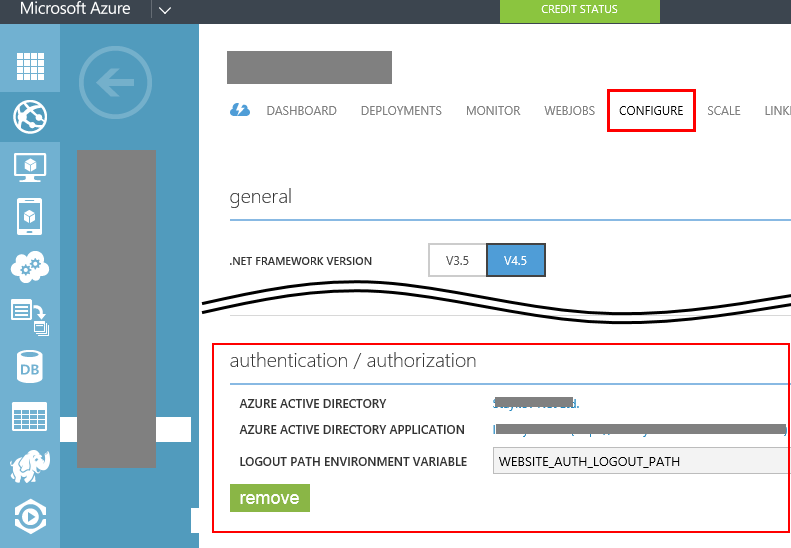 If you wish, you can learn a bit more about how to manage your Azure Active Directory here. Now your site is protected by Azure Active directory, has automatic Claims Authentication, you don’t have to worry about salting and hashing users passwords, don’t need to worry about how user would reset their password and so on. Protecting your site has never been easier! With the current release all users in the configured directory will have access the application. With the current release the whole site is placed behind login the requirement (you cannot define “public” pages, but it is relatively easy to do this in a web.config file). With the current release there is no distributed log-out so logging the user out will only do so for this application and not all global sessions (which means, that if user comes back, he/she will automatically be logged-in again). Quick, easy and works across the whole stack of supported platforms on Azure Web Sites (.NET, PHP, Java, Node.JS, Python). 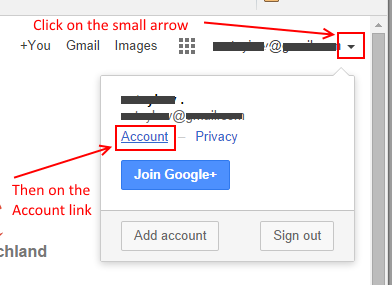 Give me your e-mail to tell you if you are being hacked! A lot of accounts from public services have recently been hacked, exploited, publicly listed, etc. With every single account breach there are at least 5 services that tell you “check if your account has been hacked” and ask you for your e-mail or account username. Almost never asking for your password. Here I will try to explain why You, dear user shall avoid using any of these services, even if the operator behind the service seems to be respectful like the “Bundesamt für sicherheit in der Informationstechnik” (or the German Agency for Information Security) which also offer the service “Check if your account exists in the hackers networks that we monitor”. You should immediately change your password! Hey, gimmie your e-mail, I will tell you if it is hacked! I will not save your e-mail address anywhere, you can trust me! While the first warning have some sense, none of the others does! For Your own good and safe Internet browsing, do not ever use any services that pretend to tell you if your account is being hacked or not! Without pretending for be a thorough analysis, let me tell you how these attacks (for hacking user accounts) work. In order to “hack” your account, the attacker have to first focus on a Service. This is the easiest part. Just follow for couple of months the security reports from one or more monitoring agencies (like Symantec, SANS Institute, or any other) and watch out which service comes out most often. Or just pick one. Ok, the attacker has identified the service to attack. Say this is Facebook. What next? Now he/she has to hack tens of millions of accounts. Using techniques like brute-force attack to identify both login name + password will simply not work. Period. Nobody does this today! The attacker will look for other techniques to obtain, be careful here, your login name! Exactly! Your e-mail address. This very same e-mail address that other “friendly” services ask you to give them to check if your account is being hacked / hijacked! By giving your login name / E-mail address to a “let me check this for you” service, you simply fill out attackers database with real accounts that can later be used for password hacking! Now, because, You dear user have left your e-mail address in a similar service, You are already potentially subject to hacker attack! Please, never give your e-mail address or login name to any services of this kind ! 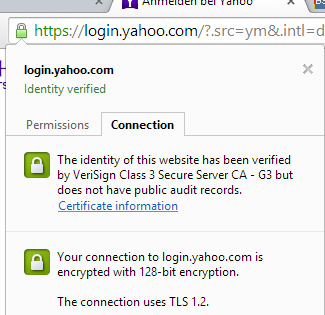 Not even to the German Agency for Information security. Even if the service seems to be trustful, using such a service does not do any good for you at all! It only serves its owners for different purposes. We slowly came to the last component of an Online identity that an attacker has to crack to solve the puzzle – the password. Your precious “123456”. Again, passwords are (almost) never hacked using brute-force attacks. Attackers usually use dictionaries of most widely used password. So called dictionary attack. Simple words, no (or few) special characters, no (or few) capital letters. 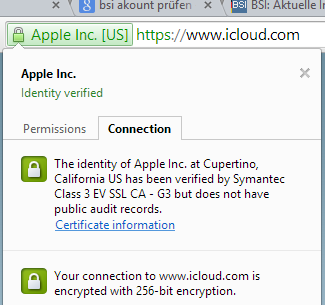 Analysis report shows that even this recent iCloud security breach was committed using dictionaries. First and foremost, never give your account (e-mail address / login name) to a 3rd parties! The worst that could happen – you will be primary target for attacks, if you were safe until now! The least that could happen – you will be entered into a list for further monitoring – SPAM, Hack attacks, etc.! Lists with valid e-mail addresses are being trade (sold for real money!) over the internet ever day! To make sure you are secure online, never use a dictionary word in your password! Your password shall not consist of a single word! Most of the online services already have mechanisms to prevent you from using weak passwords. Trust these “password strength” indicators and never let your password be in the “weak zone”. Well, be careful and always think about your own Internet safety! And never ever give your account from one Service (say Google) to another service (say German Agency for Information Security). 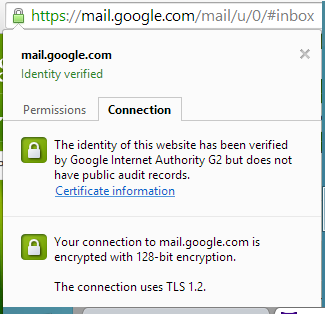 For your Google account, trust only Google. 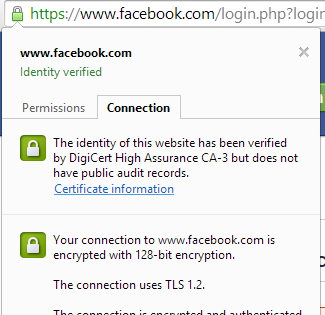 For your Facebook account, trust only Facebook, etc. If you see a report for account hack or security breach, never rush for other services, then the very one you use and is responsible for your account. Most of the big players on the market already have forensic tools in place, and make sure you know them and you know how to use them! This part, has the “Recent activity” section which shows really good and interesting information. Again, never leave (enter, give away) your personal account information to anyone on the Internet! When you receive such an e-mail, first check its authenticity – check the sender and reply-to addresses in message properties. 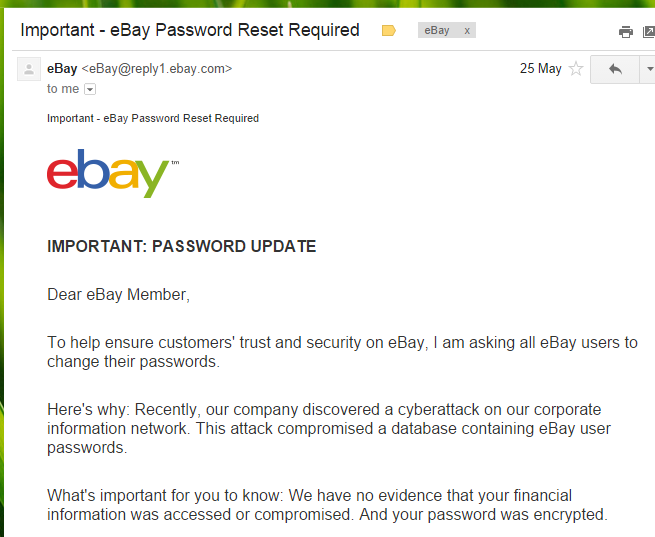 Check for official information on senders (in that case eBay) public internet site. Never click on any link directly from the e-mail. Just navigate to the service as usual and change your password. There are scenarios when your VMs on Azure cloud will need a lot of EndPoints. 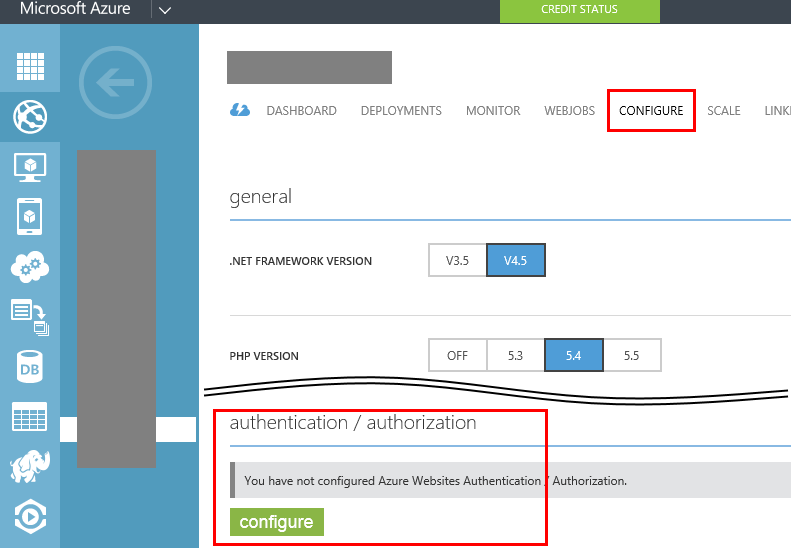 Of course you have to always be aware of the limits that come with each Azure service. But you also don’t want to add 20 endpoints (or 50) via the management portal. It will be too painful. $vm = Get-AzureVM -ServiceName "CloudServiceName" -Name "VM_Name"
You can also find the whole script as a Gist. Of course, you can use this script, with combination of Non-Interactive OrgID Login Azure PowerShell to fully automate your process. An interesting topic and very important for automation scenarios is how to authenticate a PowerShell script by providing credentials non-interactively. 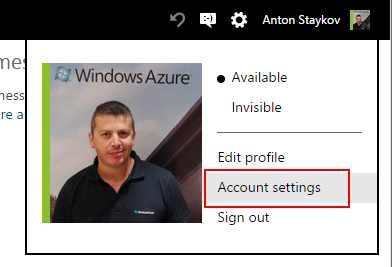 Luckily a recent version of Azure PowerShell (0.8.6) you can provide additional –credential parameter to the Add-AzureAccount command (hopefully documentation will be updated soon to reflect this additional parameter). This is very helpful and the key point to enable non-interactive PowerShell Automations with organizational accounts (non-interactive management with PowerShell has always been possible with a Management Certificate). 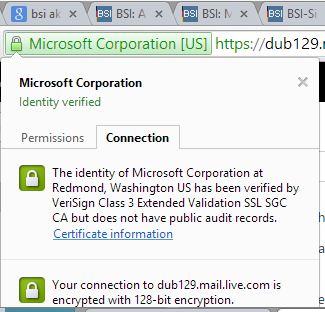 # currently (August, the 13nd, 2014) only organizational accounts are supported (also with custom domain). The whole PowerShell can also be found under the following Gist. Credits go to Jamie Thomson and fellow MVP Mike Wood from their contribution on StackOverflow.